Buy Palladium: Auto-Bailout to Make Platinum & Palladium Rise? Whether there is or isn't a bailout palladium and platinum MUST rise, but according to some sites it might not be for years. 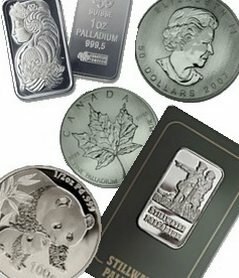 Silver, on the other hand, should be $40/oz because there is none left! I read that Rich Dad's Gold & Silver investing book and it's Robert Kiyosaki and the guy really knew his stuff. I don't have it, though, I read it in the bookstore! They have a little cafe in there. He sees silver as the best investment right now. I don't have much spare cash left, but I think I should just sell an couple ounces of gold, get $the money, and spend half of it on more silver or palladium! Well, it appears to me there are two basic camps out there when it comes to precious metals. The first camp is what I call the SHTF camp. For most of them we are about to reenter a semi stone age with silver and gold, at best, a means of barter for goods and services. No need for the P metals when there aren't going to be anymore cars being made. The second camp belives we are in a serious situation with the value of the dollar, but industrial civilization will not only survive but grow fast along with China and India. All the industrial precious metals (including silver) will be in demand and supply will be very limited for them. That is the camp I'm in and your site and Palladium is looking very good.